Mesut Özgen is an acclaimed guitarist and composer whose roots lay in traditional Turkish music. Interestingly, Mesut completed his studies as a medical doctor before pursuing music full-time. Mesut was part of the guitar faculty at University of California at Santa Cruz until recently when he joined the faculty at Florida International University as director of guitar studies and the FIU Miami Guitar Orchestra. 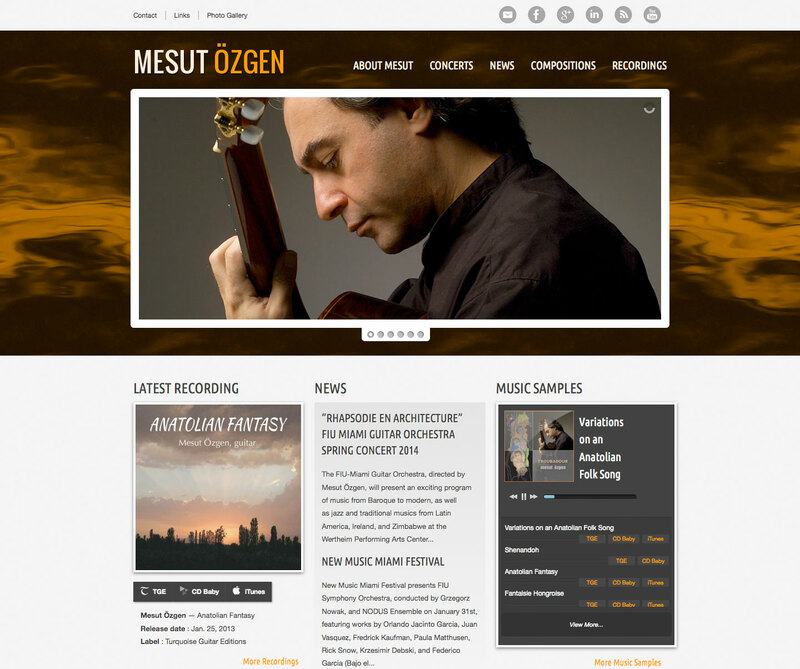 We updated Mesut’s web presence from a self-produced Dreamweaver template to an elegant, fully responsive WordPress design that includes audio samples of his work and video of performances…a great introduction of Mesut’s work to his ever expanding audience! Because Mesut has a keen interest in technology—see his lavish multimedia performances in the video section to illustrate—he wasted no time digging into the site. Early in development, he expressed interest in what WordPress could do, and his hands-on involvement along the way resulted in a highly customized website that does exactly what he wants and is easy to keep up-to-date. What more could an artist ask for in a showcase of their work?